* Unless otherwise noted, this section is based on Ernest Tate, Revolutionary Activist in the 1950s and 1960s, Volume 2, Resistance Books, 2014, which focuses on the role of the Trotskyist groups. The overview of the role British-Vietnam Solidarity Front is based on the account at the WoodSmoke blog, 1968, Grosvenor Square – that’s where the protest should be made, 18 August 2017. The Vietnam Solidarity Campaign was not the first anti-Vietnam war campaign. In the 1950s and early 1960s, the British-Vietnam Committee and the Campaign for Nuclear Disarmament had raised the issue and held protests. With increased US military inventions in 1965, the British Council for Peace in Vietnam was established in April 1965 by people associated with CND and dominated by the Communist Party. At the time Bertrand Russell was vocal around the issue of Vietnam, particularly about the Labour Party’s lack of action.1968, Grosvenor Square – that’s where the protest should be made, WoodsmokeBlog, 18 August 2017 (accessed 10 February 2018). VSC Letter of 30 April 1966, page 1 – Insert in the May 1966 issue of the Vietnam Solidarity Bulletin ( via Marxists.org). On 20 December 1965, the Bertrand Russell Peace Foundation held a public meeting to celebrate the fifth anniversary of the founding of the National Liberation Front in Vietnam. At the event, Ralph Schoenman of the BRPF called for a campaign against the war in Vietnam by mobilising opposition on the streets and setting up an international tribunal to investigate US war crimes there – the latter of which became the Russell War Crimes Tribunal. 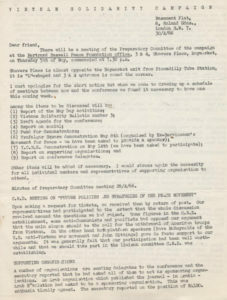 A Preparatory Committee was set up to establish the campaign,See also: Vietnam Solidarity Campaign special letter, 30 April 1966 (accessed via Marxists.org). essentially made up of IMG activists. Pat Jordan, Secretary and Coordinator of this committee, was paid by the Foundation to do this work, and the BRPF, lead by Schoenman, was active in generating support for the campaign, including doing many talks. Jordan moved to London and encouraged others to join him, in what was to become the embryonic IMG branch there. Meanwhile, in February 1966, the IMG helped set up local VSC groups around its own branches in Hull, Nottingham and Scotland. A founding conference on 4-5 June 1966, at the Mahatma Gandhi Hall in London, attracted 200 people from a broad cross-section of the left. Opened by Bertrand Russell and chaired by Schoenman, the conference officially launched the campaign. Among those present were Maoist groups, led in the main by Manchanda. Unable to agree with the final platform, they walked out and promptly established the Britain-Vietnam Solidarity Front.1968, Grosvenor Square – that’s where the protest should be made, WoodsmokeBlog, 18 August 2017 (accessed 10 February 2018). There was also hostility towards the campaign from the Socialist Labour League under Gerry Healy. VSC Letter of 30 April 1966, page 2 – Insert in the May 1966 issue of the Vietnam Solidarity Bulletin (via Marxists.org). Nevertheless, a VSC National Committee was set up, which included people from the International Marxist Group, the International Socialists and the Bertrand Russell Peace Foundation. The Chairman was Ralph Schoenman, and Bertrand Russell the Honorary President.Conference Report, Vietnam Solidarity Bulletin, July 1966 (accessed via Marxists.org). However, it was a figurehead body that rarely met; the day to day work was carried out by mostly IMG people working from the BRPF office, focusing on both the VSC and the War Crimes Tribunal. The Tribunal itself was formally launched in Paris on 17 November 1966. Author’s note: Given that the Tribunal team were actively communicating with the National Liberation Front in Vietnam in order to get the tribunal off the ground, it is highly likely the BRPF was subject to monitoring by the security services. Throughout 1966 and 1967, the VSC continued to grow. In November 1966, it held a national conference in Edinburgh. Ernest Tate wrote of it in these years:Ernest Tate, ”Revolutionary Activist in the 1950s and 1960s, Volume 2”, Resistance Books, 2014. The VSC, despite its growth and an impressive list of organisations supporting it, was still a very loose kind of organization, not much more in reality than a network made up of small ad hoc groups scattered through the country, with a few branches on some of the major universities. With the help of the Foundation to finance its staff and provide free office space at its new building at 49 Rivington Place, it quickly evolving into a fairly effective campaigning force. On 2 July 1967, a VSC demonstration in London attracted 5,000, and saw 31 arrests following clashes with police.1968, Grosvenor Square – that’s where the protest should be made, WoodsmokeBlog, 18 August 2017 (accessed 10 February 2018). According to Tate, the VSC understood the advantages of being a conscious part of an international anti-war movement, and they increasingly coordinated with US anti-war protests when issuing appeals for international days of action. Many of the anti-Vietnam war campaigns internationally were organised by groups associated with the Fourth International, and they often followed the lead of the US campaigners when international days of protest were called for. In 1967 Ralph Shoenman and Tariq Ali were doing talks on Vietnam around the country. Ali, then with the New Left Review, emerged as the leading spokesperson in the media on the issue and acted as an effective ambassador for the VSC, though he was not involved in the running of it. Close to IMG people in London, he would only join the IMG in late 1967, and then on the tacit acceptance that he would be focusing on his own projects (in May 1968 he set up the popular left-wing newssheet ”Black Dwarf”). The killing of Che Guevara by US forces in Bolivia on 9 October 1967 had a further radicalising effect on young people. The IMG with its focus on the communist revolutions in Cuba and Vietnam, its contacts through the Fourth International and the BRPF engagement with the struggle in Bolivia, meant both the IMG and VSC were in a position to tap into this growing movement seeking revolutionary change. That VSC protests had a more militant and confrontational tone than previous anti-war ones, and were led by figures with fewer connections to the establishment, also made them attractive to the rising student radicalism of 1968. However, the successful campaign-building was in danger of being disrupted by the financial crisis within the Bertram Russell Peace Foundation in autumn 1967, leading to Ken Coates taking control of the organisation. He evicted the VSC from their space at Rivington Place, and fired the IMG members working on behalf of both the VSC and the BRPF. Jordan, then General Secretary of the IMG, expelled Coates in response. Thus, days before the October 67 protest, the entire VSC campaign had to decamp to the IMG offices at Toynbee Street.Mike Martin, Guest post: A short account of the International Marxist Group, RevolutionaryHistory.co.uk, 17 December 2017 (accessed 12 January 2018). The upshot was the VSC moved out from under the wings of the Foundation, which thereafter had little role to play in the Campaign. The demonstration of October 1967 was the effective start of the mass movement against the Vietnam War in the UK. Around 10,000 assembled in Trafalgar Square and marched on the US Embassy in Grosvenor Square, where police awaited them. Encouraged by organisers to resist the expected police violence, scuffles followed and protestors broke through police lines. As Mike Martin put it: Mike Martin, Guest post: A short account of the International Marxist Group, RevolutionaryHistory.co.uk, 17 December 2017 (accessed 12 January 2018). Militant opposition to the war was front page news and the activist layer was greatly energised. Despite the split from the Peace Foundation, the VSC continued to grow, and publish its monthly Bulletin and pamphlets critical of Prime Minister Harold Wilson’s complicity in the Vietnam War. In London alone, it grew to a dozen active branches. It held a national conference on 18-19 June 1968 at Conway Hall, the first since its founding.On the eve of the VSC conference, International (newsletter of the International Marxist Group), Vol. 1, No.1, May 1968 (accessed via Marxists.org).Vietnam Solidarity Campaign Conference, Vietnam Solidarity Bulletin, no.14, May 1968 (accessed via Marxists.org). In July 1968 it was able to rent its own office space at 120 Commercial Road, E1, and began preparing for the next large protest – October 1968. The protests themselves are detailed below. From its beginning, the VSC, though controlled by the IMG, sought to build a ‘united front’ to mobilise as many people as possible. To bring in other political groups they worked through Ad Hoc Committees, which were more loosely organised. They created a temporary space to put aside political differences and mistrust among participating groups, and to focus instead on the event itself. This allowed other leading Trotskyist groups such as the Socialist Labour League and Revolutionary Socialist League to become involved in organising for protests, though they would otherwise not work within the VSC given wider political differences with the campaign’s positions. Ernest Tate wrote:Ernest Tate, ”Revolutionary Activist in the 1950s and 1960s, Volume 2”, Resistance Books, 2014. …before each action we initiated an “Ad Hoc Committee” around a few minimum demands, but that had at its core the demand that the Americans should get out of Vietnam immediately. In many cases this kind of cooperation occurred spontaneously at a local level, with ad hoc committees popping up all over the place, giving the lead as to how the VSC should proceed nationally. It was also through this structure that activists in non-aligned groups became involved in campaigning around Vietnam, though the organisations they were members of remained aloof. For example, the Ad Hoc Committee for the 17th March 1968 protest had the support of some Young Communist League clubs, Labour Party activists and also the British Vietnam Solidarity Front, while older, more established groups such as the Communist Party dominated CND did not send representatives. Indeed, the Communist Party, and its youth branch, the Young Communist League, formed their own National Committee Against The Vietnam War. Though a practical solution to political differences, the Ad Hoc Committee approach did not resolve all issues, and constituent groups approached them differently. The International Socialists were generally supportive of the Committees and organised their own caucus within them, as well as being involved through the VSC itself. While the British-Vietnam Solidarity Front had a very rocky relationship with the various Ad Hoc Committees. The US anti-war movement had called a protest for the 19th March, 1968, to mark the 18th anniversary of the first protest in Saigon against the US presence there. In response the VSC called a meeting in January 1968, at Toynbee Hall. At it, an Ad Hoc Committee was established to hold a demonstration in London on 24th (the date was later changed to 17th to avoid a clash with a Youth CND march). The endpoints of the march were also chosen as Trafalgar Square to the US Embassy in Grosvenor Square. Thereafter, there were fortnightly organising meetings at the BRPF’s premises at 49 Rivington Street.Dave Robinson, V.S.C. NOTES, The Week (newsletter of the International Marxist Group), Vol. 9, No.3, 17 January 1968 (accessed via Marxists.org). The protest of 17th March turned out 30,000 protestors, filling the rallying point at Trafalgar Square. Following speeches from IMG / VSC campaigners, the International Socialists and Vanessa Redgrave, they marched to Grosvenor Square. When police pushed back, protestors started fighting back, leading to many arrests in the subsequent disturbances. Among those arrested was one IMG member who sat on the VSC executive committee. The event established Tariq Ali in the national consciousness as the figurehead of the movement, not least for his declared intent to occupy the US Embassy in solidarity with the Vietcong occupation of the US Embassy in Saigon. 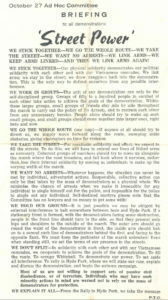 The violence of the day received a lot of media attention, to which the VSC responded:Marjorie Holt, The ‘Punch Up’ or The Pattern of Protest, ”Vietnam Solidarity Bulletin”, Issue 13, April 1968 (via Marxists.org). We have, since October 22nd, made it clear that the V.S.C. Ad hoc Committee is an umbrella movement, covering all shades of opinion and protest. Nobody is compelled or expected to support militancy – all that is necessary if violence breaks out is for those who disapprove to retire from the scene! The issue of police violence was brought up in Parliament, where accounts of unprovoked assaults by officers, and gathered by the National Council on Civil Liberties, were read out on 4 April, along with a report of police actively seeking to destroy photographic evidence of events. Heading police operations for the day was Commander John Lawlor, who oversaw Metropolitan Police’s “1 Area”, covering central London.House of Commons Debate of 4 April 1968: Grosvenor Square (Demonstration), ”Hansard”, Vol. 762 (accessed 10 February 2018). Youth CND organised an anti-Vietnam War protest for 24 March, which was overtly supported by the Communist Party and the Young Communist League. The protest was advertised as ‘Disassociation Day’, and urged the UK government to distance itself from the US military’s actions in Vietnam. Around 3,000 people took part in a march from Kennington Park, via Trafalgar Square then to Downing Street where letters of protest were handed in. T. Alleys, Two Demos Reviewed, ”Solidarity Pamphlet”, No. 28, Easter 1968 (accessed via Libcom.org). According to Special Branch reports, it was a mostly peaceful protest, though six were arrested at Trafalgar Square and some people sought to get through police lines at Downing Street. Though a CND event, Trotskyists and anarchists were also present. Given the events of 17 March, there was significant press in attendance; the police mobilisation involved 416 officers, again under Commander John Lawlor.John Lawlor, Youth Campaign for Nuclear Disarmament, Sunday 24th March 1968, ”Metropolitan Police”, 24 March 1968; report included in a letter sent by a Metropolitan Police (James Starritt?) Assistant Commissioner to the Home Office Under Secretary of State on 25 March 1968 (accessed via SpecialBranchFiles.uk). 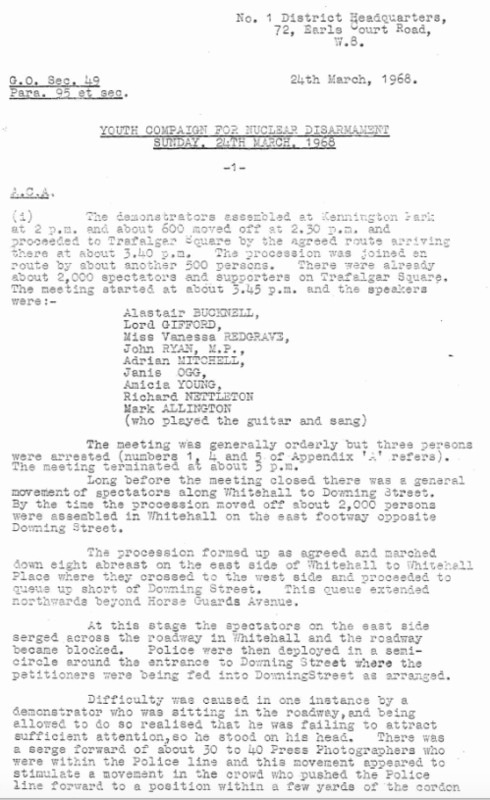 The Special Branch file report shows that officers present in the protest were identifying political activists.Special Branch report in relation to Youth Campaign for Nuclear Disarmament, Metropolitan Police, 24 March 1968 (accessed via SpecialBranchFiles.uk). ... whose name remains redacted. There was a student demonstration of around 1000, lead by Tariq Ali on 15 April 1968, with protestors protesting outside the Holborn offices of the German newspaper group Springer (the Daily Mirror building). Notes from the press, International (newsletter of the International Marxist Group), Vol. 1, No.1, May 1968 (accessed via Marxists.org). A demonstration was held at the French Embassy over France’s role in Vietnam.Vietnam Solidarity Bulletin, Issue 16, July 1968 (accessed via Richman papers, ”vide infra”). For the most part, the main communist parties did not partake in the Vietnam protests, something which caused dissatisfaction and defections. However, seeing the upswing in interest, the Young Communist League, the youth wing of the Communist Party of Great Britain, did seek to engage with the protests. Though it kept its distance from the VSC, some of its activists participated in the ad hoc committees. Nevertheless, seeking to tap into the growing movement, the YCL formed a committee to call for an anti-Vietnam War demonstration on 21 July 1968. However, when the Maoist British Vietnam Solidarity Front gained a majority on the organising ‘July 21 Committee for Solidarity with Vietnam’ the YCL withdrew. The BSVF continued the plans for a protest, and a march on the US embassy went ahead, though it did not reach the size or attract the attention of VSC protests.1968, Grosvenor Square – that’s where the protest should be made, WoodsmokeBlog, 18 August 2017 (accessed 10 February 2018). 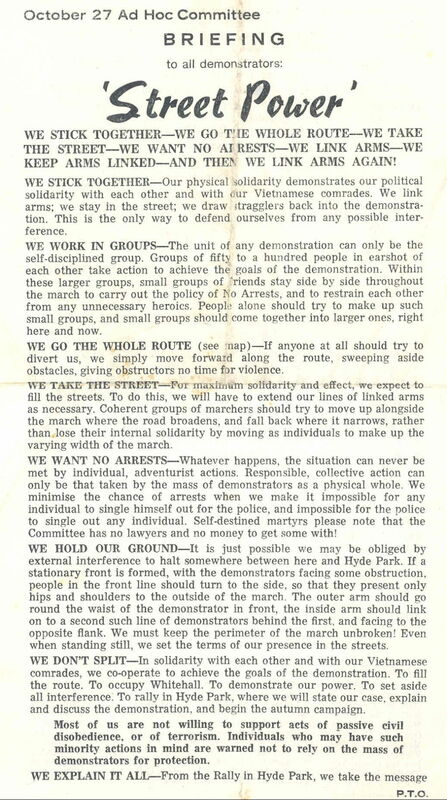 The VSC did advertise this protest and associated events.Vietnam Solidarity Bulletin, Issue 16, July 1968 (accessed via Richman papers, ”vide infra”). The high profile protest of March, along with the May 1968 events in France, brought considerable attention to the next major event planned by the Vietnam Solidarity Group, a protest in October 1968, named ‘The Autumn Offensive’. Media and politicians went overboard, concerned that riots similar to those in France would be seen on British streets, and the press spoke of bombs and violence, which in turn only generated further interest. 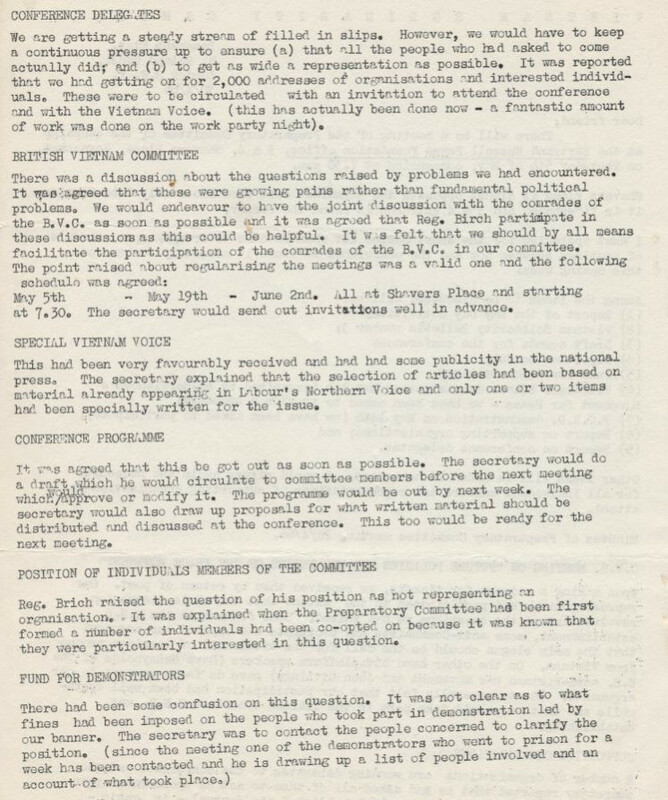 Again the VSC took the lead and they convened a meeting on 13 June 1968 to initiate the Ad Hoc Committee that would plan the event.August 1968 issue of the I.M.G.’s newsleftter, International (accessed via Marxists.org). It notes the meeting was attended by many groups including representatives of the Young Communist League, Communist Party,International Socialism, CHURCH, Underground Press, VSC branches, Overseas Students’ Coordinating Committee, International Marxist Group, Militant and others. Though many groups took part, power remained effectively in the hands of the IMG activists who would also lead co-ordination on the day itself.Ernest Tate, Revolutionary Activist in the 1950s and 1960s, Volume 2, Resistance Books, 2014. Planning meetings took place fortnightly, including in the north of England. These were subject to dirty tricks with venues being mysteriously canceled, so meetings had to take place in the open air. Tate recalled fifty people attending such a meeting having to sit in a circle on the Yorkshire moors.Ernest Tate, On the Secret Internal Police Reports about the 1968 mobilizations against the Vietnam war in in London, England, Marxists.org, 2008 (accessed 10 February 2018). 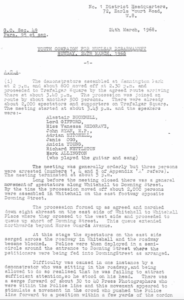 This open air meeting is probably the National Committee meeting in Sheffield of the weekend of 7-9 September which set down the plans for the 27 October (and was mentioned in an article in The Times – see Part 3). See also: Diary of Forthcoming Events: September-October, Vietnam Solidarity Bulletin, No. 17, 1968 (accessed via Marxists.org). [/ref] Tariq Ali also writes of it in his account of 1968:Tariq Ali, Street Fighting Years: An Autobiography of the Sixties, Verso, 2005. We were due to meet at Sheffield University, but at the last minute the Secretary of the Students’ Union, a supporter of the Labour Government, insisted that the meeting could only take place if he was allowed to attend. Since he was not even a member of the VSC we declined his offer and left. None of the pubs in the town was willing to rent us a room; the publicans had clearly read the more lurid accounts in the tabloids and did not want to be seen providing faculties for insurrectionists. Our search was not made easy by the fact we were being openly followed by a posse of police cars. Ultimately, we pretended to leave town and the police gave up the chase. In fact we took advantage of the good weather and decided to meet on the moors outside Sheffield. The VSC leadership finally met in a bomb crater near Ringinlow, a dozen miles from Sheffield. The discussion commenced and it soon became obvious that an overwhelming majority was of the view that 27 October should be a show rather than a test of strength. We discounted the possibility of occupying the US embassy, even with a hundred thousand people. The police were now well prepared, the Labour Government had engendered a national hysteria, the media were still strong on their line of subversive plans to seize the Stock Exchange and any real attempt to take the embassy would, we were convinced, lead to bloodshed. None of us was prepared to play with anyone else’s life. We did, nonetheless, agree to take over the streets and not tolerate any heavy police presence. After we had made the crucial decision to disperse in Hyde Park, the local police arrived and instructed us to move since we were trespassing on private property. A debated commenced on our common law rights, but as they appealed on their intercom system for reinforcements, we decided to leave. This time they followed our convoy to the motorway. Mostly, these meetings were mainly chaired by people from the VSC and focused on practical issues such as slogans and routes. There was disagreement over the route and goals of the day. The VSC / IMG caucus favoured a march from Embankment, via Trafalgar Square, to finish with a rally in Hyde Park. For them, the focus was on getting as many people there as possible to put pressure on the Wilson government to change its polices over Vietnam. This meant keeping it family friendly, and avoiding conflict with police for its own sake. They also considered the US Embassy would effectively amount to walking into a police trap.Ernest Tate, On the Secret Internal Police Reports about the 1968 mobilizations against the Vietnam war in in London, England, Marxists.org, 2008 (accessed 10 February 2018). The International Socialists argued for the Bank of England as the final rallying point, while the Maoists wanted a return to the US Embassy. In the end, the Maoists, Communist Party / Young Communist Party and Left Labour activists backed the IMG position which was carried by a vote. As soon as the decision was made, an appeal to organise and participate went out and the VSC started producing posters. “Street Power” – leaflet issued by VSC ahead of the 27 October protest (via WoodsmokeBlog) . To drum up interest, a public mass meeting took place at Conway Hall on 17 September.Diary of Forthcoming Events: September-October, Vietnam Solidarity Bulletin, No. 17, 1968 (accessed via Marxists.org). 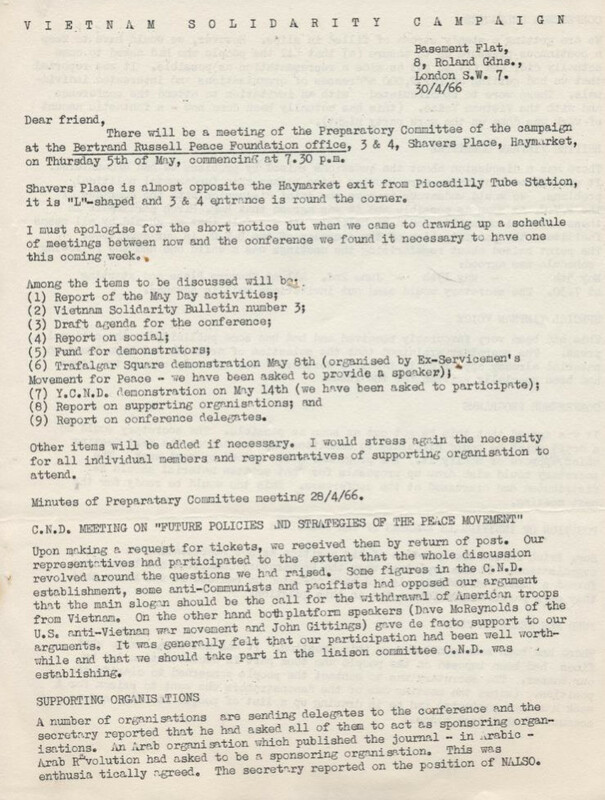 This is likely the meeting mentioned by Ernest Tate in his book, when he talks of an early Ad Hoc Committee planning meeting at Conway Hall being packed with 100 people, and many local VSC committees sending representatives. Vide infra. At this, the BVSF argued vocally that the march of the 27 October should focus on the US Embassy. Defeated again in this, they were subsequently excluded from VSC Ad Hoc Committee for 27 October. In response they set up their own parallel 27 October Committee for Solidarity with Vietnam, to continuing their focus on the US Embassy.1968, Grosvenor Square – that’s where the protest should be made, WoodsmokeBlog, 18 August 2017 (accessed 10 February 2018).Editorial Statement, International (newsletter of the International Marxist Group), Vol. 1, No.5, September 1968 (accessed via Marxists.org).Geoffrey Crossick, Political Education: an analysis of the September 17th Public Meeting, Vietnam Solidarity Bulletin, No. 18, October 1968 (accessed via Marxists.org). By this stage, the VSC had grown to several thousand campaigners, and according to Tate, was more of a network than anything else. The VSC offices at Commercial Road continued as the main organising hub, being thronged with activists. The run up to the 27 October saw media become increasingly hysterical and run a hostile campaign against the Vietnam Solidarity Campaign and radical student politics in general. A police raid of 3 September on the offices of Black Dwarf triggered one round of panic with press turning instructions about how to make a Molotov cocktail found on the wall there into stories of bombs being prepared across the city and small arms being purchased ahead of the demonstration (see Part 3 for more details).Letter of Commander John Smith to the Home Office 5 September 1968, containing a report from Conrad Dixon relating to various press reports on preparations for the Vietnam Solidarity Campaign Autumn Demonstration due to be held on 27th October, Metropolitan Police Special Branch, 5 September 1968 (accessed via SpecialBranchFiles.UK). Then Home Secretary, James Callaghan, held cabinet level discussions about mobilising the military. Fears the VSC would be banned and its top people jailed, led the IMG Political Committee to set up an alternative leadership structure in case of this eventuality. The VSC started their own media campaign, with Tariq Ali playing a leading role in this. They also secured the support of leading left figures in the ruling Labour Party, such as Ralph Miliband. The Ad Hoc Committee also issued a leaflet called ‘Street Power’ saying it wanted no arrests and focus on going the whole route. All sides on the left expected police violence and mobilised with this as a likely eventuality, though taking different approaches to it. The rest of the march passed by 10 Downing Street where it handed in a petition, before continuing to Hyde Park for a mass rally and speeches. However, for many, after all the hype, the march of October 1968 was an anti-climax. Students in London turned to focus on their universities, in particular the occupation of the London School of Economics, or other issues such as Apartheid, Palestine and workers struggles.Ernest Tate &amp; Phil Hearse, The Building of the Vietnam Solidarity Campaign and its Consequences for the British Left, paper presented at the Left Before 1968 conference, University of East Anglia, February 2016 (accessed via Marxsite.org, 8 August 2017). Within the VSC political tensions also came more to the foreMike Martin, The Issues before VSC, International (newsletter of the International Marxist Group), Vol. 2, No.1, January 1969 (accessed via Marxists.org). and relations between the IMG and International Socialists started breaking down.All out for March 16, International (newsletter of the International Marxist Group), Vol. 2, No.2, February 1969 (accessed via Marxists.org). In the immediate aftermath, the VSC continued to organiseA VSC National Committee meeting took place in London on Sunday, 10 November 1968, in London – Papers of Maria and Geoff Richman, Bishopsgate Institute, vide infra. While a National Council meeting was held in Leeds on 19 November 1968 – see National Council, Vietnam Solidarity Bulletin, no. 20, January 1969 (accessed via Marxists.org). and on 20 December a public meeting was held at the Conway Hall to celebrate the anniversary of the National Liberation FrontV.S.C. Future Activities, Vietnam Solidarity Bulletin, no. 19, 1968 (accessed via Marxists.org). It held it’s National Conference over 1-2 February 1969 at Conway Hall.”V.S.C. Conference Material”, Papers of Marie and Geoff Richman, Bishopsgate Institute, (vide infra). Another demonstration took place on 16 March 1969 (organised in the name of the March Vietnam Mobilisation Committee), but only attracted between 4,000 – 10,000. The death of Ho Chi Minh in October 1969 heralded the end of the VSC as an active campaign. At a memorial meeting organised by the VSC, the IMG and International Socialists publicly split, effectively ending the long-standing coalition. The VSC itself quickly faded away after this, its swan-song being a brief re-emergence to protest the invasion of Cambodia the following year (April – July 1970).Bruce Robinson, 1968: Vietnam solidarity and the British left, WorkersLiberty.org (Alliance for Workers Liberty), 20 March 2008 (accessed 8 August 2017).Unity and Vietnam, International (newsletter of the International Marxist Group), Vol. 2, No.9, October 1969 (accessed via Marxists.org). Mention is made of a demonstration being planned against the Vietnam War in London on 23 November (15 November in Scotland), but we have not yet found contemporary accounts of it happening.Unity and Vietnam, International (newsletter of the International Marxist Group), Vol. 2, No.9, October 1969 (accessed via Marxists.org).Mass Action To Aid Vietnamese, International (newsletter of the International Marxist Group), Vol. 2, No.10, November 1969 (accessed via Marxists.org). Mike Martin, IMG member and core VSC organiser, later wrote of the campaign:Mike Martin, Guest post: A short account of the International Marxist Group, RevolutionaryHistory.co.uk, 17 December 2017 (accessed 12 January 2018). The whole VSC experience was pretty chaotic. We had not so much organised a protest movement as created a channel through which it could pour unhindered. 1, 3, 6, 20, 29. ↑ 1968, Grosvenor Square – that’s where the protest should be made, WoodsmokeBlog, 18 August 2017 (accessed 10 February 2018). 2. ↑ See also: Vietnam Solidarity Campaign special letter, 30 April 1966 (accessed via Marxists.org). 4. 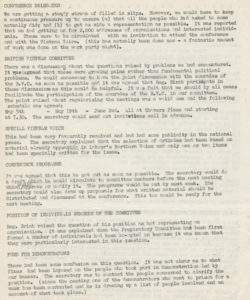 ↑ Conference Report, Vietnam Solidarity Bulletin, July 1966 (accessed via Marxists.org). 5, 11. ↑ Ernest Tate, ”Revolutionary Activist in the 1950s and 1960s, Volume 2”, Resistance Books, 2014. 7, 8, 43. ↑ Mike Martin, Guest post: A short account of the International Marxist Group, RevolutionaryHistory.co.uk, 17 December 2017 (accessed 12 January 2018). 9. ↑ On the eve of the VSC conference, International (newsletter of the International Marxist Group), Vol. 1, No.1, May 1968 (accessed via Marxists.org). 10. ↑ Vietnam Solidarity Campaign Conference, Vietnam Solidarity Bulletin, no.14, May 1968 (accessed via Marxists.org). 12. ↑ Dave Robinson, V.S.C. NOTES, The Week (newsletter of the International Marxist Group), Vol. 9, No.3, 17 January 1968 (accessed via Marxists.org). 13. ↑ Marjorie Holt, The ‘Punch Up’ or The Pattern of Protest, ”Vietnam Solidarity Bulletin”, Issue 13, April 1968 (via Marxists.org). 14. ↑ House of Commons Debate of 4 April 1968: Grosvenor Square (Demonstration), ”Hansard”, Vol. 762 (accessed 10 February 2018). 15. ↑ T. Alleys, Two Demos Reviewed, ”Solidarity Pamphlet”, No. 28, Easter 1968 (accessed via Libcom.org). 16. ↑ John Lawlor, Youth Campaign for Nuclear Disarmament, Sunday 24th March 1968, ”Metropolitan Police”, 24 March 1968; report included in a letter sent by a Metropolitan Police (James Starritt?) Assistant Commissioner to the Home Office Under Secretary of State on 25 March 1968 (accessed via SpecialBranchFiles.uk). 17. ↑ Special Branch report in relation to Youth Campaign for Nuclear Disarmament, Metropolitan Police, 24 March 1968 (accessed via SpecialBranchFiles.uk). 18. ↑ Notes from the press, International (newsletter of the International Marxist Group), Vol. 1, No.1, May 1968 (accessed via Marxists.org). 19, 21. ↑ Vietnam Solidarity Bulletin, Issue 16, July 1968 (accessed via Richman papers, ”vide infra”). 22. ↑ August 1968 issue of the I.M.G.’s newsleftter, International (accessed via Marxists.org). It notes the meeting was attended by many groups including representatives of the Young Communist League, Communist Party,International Socialism, CHURCH, Underground Press, VSC branches, Overseas Students’ Coordinating Committee, International Marxist Group, Militant and others. 23. ↑ Ernest Tate, Revolutionary Activist in the 1950s and 1960s, Volume 2, Resistance Books, 2014. 24, 26. ↑ Ernest Tate, On the Secret Internal Police Reports about the 1968 mobilizations against the Vietnam war in in London, England, Marxists.org, 2008 (accessed 10 February 2018). 25. ↑ Tariq Ali, Street Fighting Years: An Autobiography of the Sixties, Verso, 2005. 27. ↑ Diary of Forthcoming Events: September-October, Vietnam Solidarity Bulletin, No. 17, 1968 (accessed via Marxists.org). 28. ↑ This is likely the meeting mentioned by Ernest Tate in his book, when he talks of an early Ad Hoc Committee planning meeting at Conway Hall being packed with 100 people, and many local VSC committees sending representatives. Vide infra. 30. ↑ Editorial Statement, International (newsletter of the International Marxist Group), Vol. 1, No.5, September 1968 (accessed via Marxists.org). 31. ↑ Geoffrey Crossick, Political Education: an analysis of the September 17th Public Meeting, Vietnam Solidarity Bulletin, No. 18, October 1968 (accessed via Marxists.org). 32. ↑ Letter of Commander John Smith to the Home Office 5 September 1968, containing a report from Conrad Dixon relating to various press reports on preparations for the Vietnam Solidarity Campaign Autumn Demonstration due to be held on 27th October, Metropolitan Police Special Branch, 5 September 1968 (accessed via SpecialBranchFiles.UK). 33. ↑ Ernest Tate &amp; Phil Hearse, The Building of the Vietnam Solidarity Campaign and its Consequences for the British Left, paper presented at the Left Before 1968 conference, University of East Anglia, February 2016 (accessed via Marxsite.org, 8 August 2017). 34. ↑ Mike Martin, The Issues before VSC, International (newsletter of the International Marxist Group), Vol. 2, No.1, January 1969 (accessed via Marxists.org). 35. ↑ All out for March 16, International (newsletter of the International Marxist Group), Vol. 2, No.2, February 1969 (accessed via Marxists.org). 36. ↑ A VSC National Committee meeting took place in London on Sunday, 10 November 1968, in London – Papers of Maria and Geoff Richman, Bishopsgate Institute, vide infra. While a National Council meeting was held in Leeds on 19 November 1968 – see National Council, Vietnam Solidarity Bulletin, no. 20, January 1969 (accessed via Marxists.org). 37. ↑ V.S.C. Future Activities, Vietnam Solidarity Bulletin, no. 19, 1968 (accessed via Marxists.org). 38. ↑ ”V.S.C. Conference Material”, Papers of Marie and Geoff Richman, Bishopsgate Institute, (vide infra). 39. ↑ Bruce Robinson, 1968: Vietnam solidarity and the British left, WorkersLiberty.org (Alliance for Workers Liberty), 20 March 2008 (accessed 8 August 2017). 40, 41. ↑ Unity and Vietnam, International (newsletter of the International Marxist Group), Vol. 2, No.9, October 1969 (accessed via Marxists.org). 42. ↑ Mass Action To Aid Vietnamese, International (newsletter of the International Marxist Group), Vol. 2, No.10, November 1969 (accessed via Marxists.org).